Ltd Ed Digipack incl. 3 Bonus Tracks And Bonus Video. Danish Thrash Death Metal Monster. Thrash Death Metal Monster. The Danish demolition commando returns with a vengeance and more brutal than ever before! 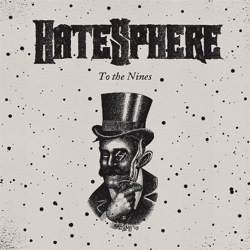 "To the Nines" pushes the pedal to the metal more than usual without forgetting Hatesphere's biggest strengths: Highspeed riffs, excellent leads, furious solos, and racing precision drumming. With masterful expertise, the quintet unites memorable melodies and killer hooklines with technical prowess. Hatesphere repeatedly incorporates fine detail, harmony, and speed variation into the mix, resulting in an album that is as compact as it is diversified. "To the Nines" delivers a monolithic offering, serves as the perfect example of how contemporary thrash metal should sound, and should by no means go unnoticed by fans of the genre!